Ever since we moved to Kansas City in 1976 we would take a week or two of vacation time around the holidays to travel east to see my family in New Jersey. It is a 1200 mile journey on I-70 & I-76 through Missouri, Illinois, Indiana, Ohio and Pennsylvania. In the early days it took longer because the speed limit was 55 mph. Our trek was greatly shortened when it was raised to 70 mph. Columbus, Ohio was about midway on the trip and we often stayed there. One time in the early 1980s we could not find a place to stay there that had a crib. So we drove about another hour and found a place at Zanesville. I really do not remember much about the place. Here is some trivia I found on the internet. The city was named after Ebenezer Zane. Novelist Zane Grey, a descendant of the Zane family, was born in the city. It has a total area of 12 square miles with a population of about 25,000. It has an airport and a train station. 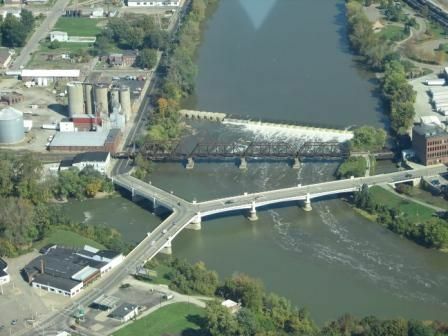 A three-way bridge called the "Y-Bridge" (pictured) spans the confluence of the Licking and Tuscarawas river to form the Muskingum river. Listed on the National Register of Historic Places, it is one of very few bridges of its type in the United States.